The best to throw it down in indie hip hop gets charted by one of the finest websites to chart indie hip hop. DJBooth.net tracks the hottest indie tracks on the site according to the voting the songs receives and the number of times it plays on the site. According to this criteria, Tech N9ne’s “Dyin’ Flyin'” is making a quick climb since its release. Today, Tech N9ne may be the most successful underground artist in hip-hop, but for many years the Strange Music general hustled—and sometimes struggled—to get his career off the ground. On new single Dyin’ Flyin’, hitting our front page on the heels of the acclaimed “Aw Yeah?” (interVENTion), Tech laces an uncredited beatsmith’s melodramatic, string-led boardwork with some cynical, adeptly-flowed reflections on the precarious nature of success in the music game. 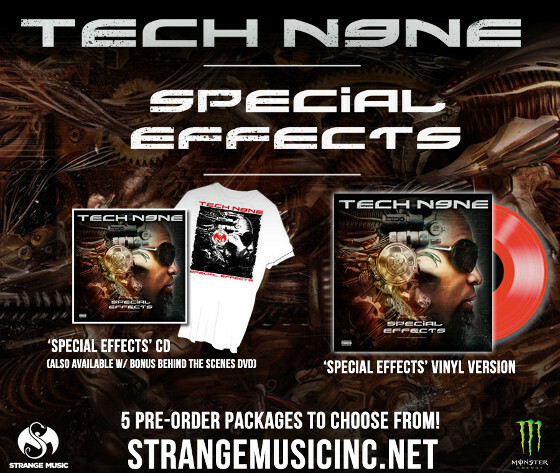 Special Effects is slated to hit record stores and online retailers May 5. Click here to pre-order the set and you’ll receive an instant download of Dyin’ in the bargain. What do you think of Tech’s ranking on the list? Too high or low?